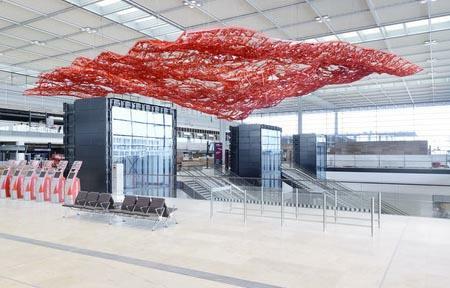 The Magic Carpet by the American artist Pae White (California) is a special work of art suspended above the check-in hall on the Brandenburg Airport in Berlin. It is a large red carpet of woven metal that shimmers through the air. The Magic Carpet covers an area of almost 1,000 m² and radiates in a warm and strong red. The work of art is based on the motif of the flying carpet and the wealth of associations it prompts. In the Berlin airport it acts as a membrane between the known and the unknown, reality and imagination, memory and hope. The artist Pae White seeks inspiration for her art in architecture, handicrafts and design. Over the years, she has developed her very unique imagery in numerous projects with books and advertising, and incorporated their delicate character into her sculptures as well. A clear and distinct artistic vision, such as that of the Magic Carpet, necessitates a team of experts willing and able to take on the challenge of realizing such an inspiring work of art. The difficult task of manufacturing the sculpture was assigned to the metal-work specialists, the German company Arnold AG (www.arnold.de), who have already made a name for themselves in producing high-precision metal sculptures for artists such as Jeff Koons and Anish Kapoor. Due to the scale and inherent geometrical complexitiy of the Magic Carpet the German consultancy bureau, ONE TO ONE, (www.onetoone.net) was appointed with the task of solving its most complex but crucial geometrical details and problems. The Frankfurt-based office of ONE TO ONE, lead by the 32-year old managing dirtector Benjamin Koren, is a technical/geometrical consultancy bureau, that assists many renowned architects and artists in realising difficult constructions, for example in concert halls or innovative trade-fair projects, conceiving high-quality acoustic panels or calculating the complex installation of an art work. Benjamin Koren: "ONE TO ONE carries out the geometrical analysis and implements the designs manufacturer's fabrication concepts in a variety of scales, from small to large projects. From art sculptures, like the Magic Carpet in the Berlin Airport to full-scale concert halls, like the Elbphilharmonie in Hamburg." (photo below). For the Magic Carpet ONE TO ONE worked very closely with the metal workers of Arnold AG and the American artist Pae White, who supplied a number of sketches of her art work. "The artist provided a number of very intricate and beautiful sketches and a 3D-model," Benjamin Koren explains. "It was however too big, you couldn't build like that, nor in one piece. So we had to break the geometry down into smaller elements for analysis, to make it easier and ready to handle." Each smaller element had to go through a number of geometrical transformation processes: from a 2D sketch of the art work, to an 'ideal' 3D CAD version of the sculpture in the computer, down to printed 2D flat production drawings, only to be assembled in real 3D space at the airport again. Added to the complex nature of its geometry were the sheer numbers of parts: the total length of all elements approached 15,000m, with approximately 500 structural knots and 60,000 bolts, each of which had to be calculated individually. Koren explains:"That is where ONE TO ONE comes in: when dealing with such large quantities at such high levels of accuracy the position, shape and connection of each element simply has to be defined mathematically and solved automatically. We developed a number of software algorithms, specifically for this project, which solved all these problems, not as humans would in days, but within seconds!" As such ONE TO ONE acts as the "technical calculators" or "mathematicians" behind the art work, acting also as the consultants of production and the technical realisation of a complex project: "We do not regard ourselves as purely theoretically minded, solving mathematical and geometrical problems on paper only - on the contrary, we are practical people, always with the real and finished end result in view, getting closely involved in how the projects are constructed, how the geometry works and how the parts fit together. In this way we have already worked on a number of projects." ONE TO ONE specializes in bespoke geometric computation, precision 3D-CAD constructions, integrative CAM fabrication of complex geometric elements and inovative research and development at all scales. 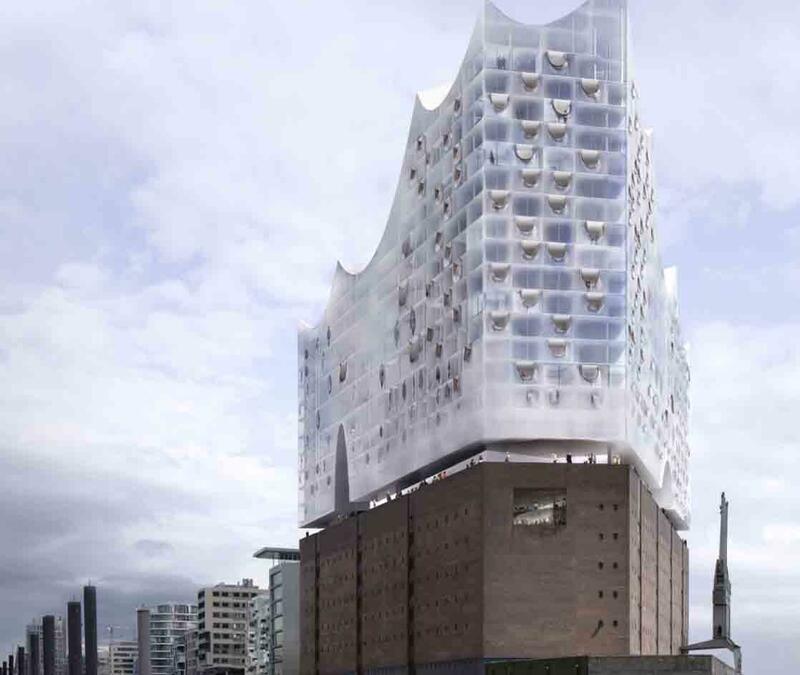 When complex designs or large quantities of elements pose a challenge for the designer of, for example, a concert hall, or the manufacturer of the materials, ONE TO ONE offers smart solutions to the most difficult geometrical and computational problems: for example 10,000 non-standard acoustic panels for the Elbphilharmonie concert hall in Hamburg. In this way, ONE TO ONE was also involved in the Philharmonie de Paris, a wonderful concert hall with a unique architecture. Thanks to the high-precision work of ONE TO ONE on a scale model of the concert hall, the Philharmonic will have exceptional acoustics when it opens in 2015. The Philharmonie in Paris is a joint undertaking financed by the French government and the city of Paris, with the support of the Greater Paris region. The plan is to build a major new music complex in the Parc de la Villette. The project is centred on a 2,400-seat concert hall and includes an educational wing aimed at reaching out to a broad spectrum of the public. The project submitted by Ateliers Jean Nouvel was chosen by an international design competition in 2007. Sited in a park that already has a cultural focus, in an up-and-coming district on the northeast edge of Paris, and clearly visible from the outer suburbs of the city, the innovative architectural design of the complex will make a strong statement. The acoustics of the concert hall will meet the most demanding international standards. To design these acoustics, Jean Nouvel has joined forces with Harold Marshall and is working in consultation with Yasuhisa Toyota of Nagata Acoustics. The design moves away from the classic “shoebox” formation in which audiences sit directly in front of the musicians, in favour of engaging the audience further with the performers as the seating is arranged all the way around the stage. Designed principally to host major symphony orchestras – with the Orchestre de Paris as the resident orchestra – the Philharmonie de Paris will also promote other forms of musical expression such as jazz and world music. Very much an orchestral centre, promoting musical education and culture, a variety of daytime courses in music will be offered to young people and adults alike. The building, covering an area of approximately 20,000 square metres, will comprise – in addition to the main concert hall, its foyers and rehearsal rooms – administrative and technical rooms, an educational wing, exhibition spaces, a café, a restaurant, all the necessary logistical and technical facilities, and a car park. As far as acoustics are concerned, the concert hall will envelope the audience around the stage, following the model pioneered by the Berlin Philharmonie, in order to intensify the feeling of intimacy between the performers and their audience.